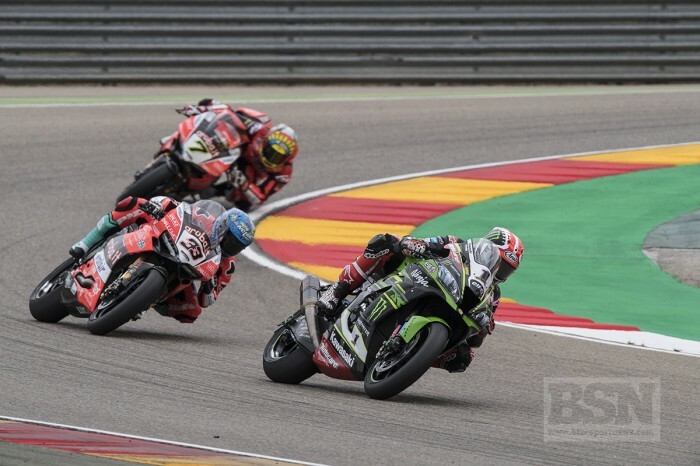 Reigning WorldSBK king Jonathan Rea was denied a record-breaking double win at Aragon on Sunday by title rival Chaz Davies but some canny work on gearing meant he wasn’t left for dead on the long back straight as happened in 2017. The Kawasaki man, whose ZX-10RR had its wings clipped by the new rev-regulations over the winter, was able to stay with the Ducati on corner exit and remain in the slipstream but it is gearing that now limits the scope of the green machine, not rpm. And Rea believes the engine upgrades which are now allowed by concession points for his mob but not Ducati won’t maker a huge difference. “To be honest we had first gear so good for the exit of turn 15 onto the straight, so it just depends. Sometimes I would get a small wheelie and lose the drive but when I got it perfect I could exit very similar to Ducati,” Rea told bikesportnews.com. Rea also spoke about the possibility of engine upgrades now, as post race calculations now allow Kawasaki to make one engine upgrade, like all the others except Ducati. Would it help Rea right now? Pushing the chassis harder, while saving tyre, is the priority for KRT. “Right now the chassis, especially working with Showa, we are trying to define a bike that gives me a lot more confidence to release the brake and turn the corner,” said Rea.